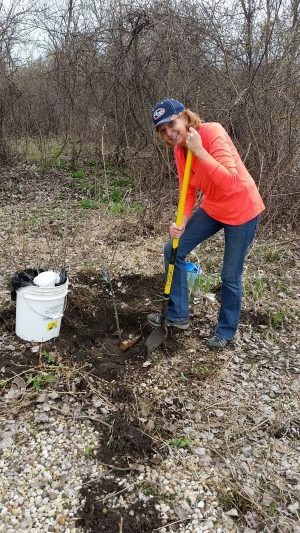 For the sixth year in a row, the Rock River Trail Initiative (RRTI) distributed 10,000 trees in the 11 counties of the Rock River, April 13-April 15. Chad Pregracke, president of Living Lands and Waters’ One Million Trees program, has donated these 60,000 trees to the Rock River Trail Initiative and our river. The kind congregation members of People’s United Methodist Church in Oregon came out for a workday and helped plant more than 30 oak trees at Three Gaits. Located in Stoughton, Wisconsin, Three Gaits, Inc., is a non-profit, tax-exempt organization whose mission is to provide equine-assisted activities and therapies that enhance the lives of people with physical, emotional, or intellectual challenges.